Congregation Beth Israel in Bellingham, Wash.,started out its life as a Lithuanian Orthodox shul in 1908. Today, thecongregation is housed in a stunning building in the woods, on 20 acres ofland. 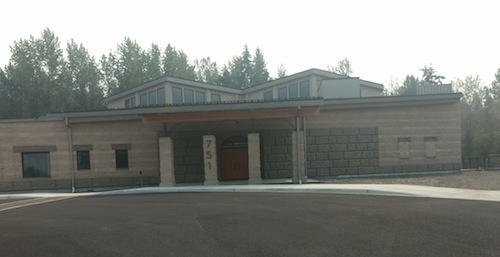 The newly constructed synagogue opened its doors in March of this year to serve the spiritual and cultural needs of Reform and Conservative Jews of Bellingham and Whatcom County, Mount Vernon and the Skagit Valley, the San Juan Islands and even Jews from Metro Vancouver. Several weeks ago, for instance, the congregation hosted a screening of a film about Israel, The Original Promise, which was produced by Fraser Valley resident Bill Iny (who is a member of Vancouver’s Congregation Beth Hamidrash) in conjunction with the Northwest chapter of StandWithUs, an advocacy group for Israel that has chapters in the United States, Canada and Israel. The screening, which attracted more than 100 Jewish and non-Jewish attendees, featured a panel discussion moderated by Beth Israel’s spiritual leader, Rabbi Joshua Samuels. This event is one of many that the Pacific Northwest synagogue has hosted since relocating. However, while the synagogue building may be new, it houses a nearly 300-year-old miniature Torah from Lithuania that was commissioned in the mid-1700s by a czar of Russia. Samuels said the czar gave the Torah to his doctor, one of Samuels’ Lithuanian ancestors, and the Torah has remained in his family ever since. His great-grandmother – hiding the Torah in a big coat – fled Lithuania with her children to the United States, joining her husband in Fargo, N.D., where he had found work. “It’s the highlight of any visit,” he added. Samuels, who is a fifth-generation San Franciscan – his family arrived in San Francisco during the gold rush – worked in the stock brokerage business in Los Angeles and San Francisco before deciding to make a major life change. “I felt a gentle nudging to take another path in life and, after some soul-searching for about three years, I applied to rabbinical school at Hebrew Union College-Jewish Institute of Religion,” he said. After studying in Jerusalem and Los Angeles for five years, Samuels was ordained in 2010. He began his new career at Temple Beth Hillel in Valley Village, Calif., before coming to Bellingham to become Beth Israel’s spiritual leader in July 2012. Congregation Beth Israel was established in 1908 with 30 families, including Jews from Germany and Lithuania. The synagogue was Orthodox until 1986, when it became a Reform shul and joined the Union for Reform Judaism, which, at that time, was called the Union of American Hebrew Congregations. The congregation has grown to include 275 families and moved to its new building from a synagogue on Broadway that was built in 1925 (and was recently sold). The new building was built to accommodate the congregation’s growing community, drawing worshippers throughout the region and from as far away as Surrey, White Rock and Chilliwack, to attend services and the Sunday school. (For the Canadian congregants, there is the added bonus of being able to shop at Trader Joe’s after Sunday school.) The synagogue also hosts a Conservative minyan on the fourth Saturday of every month. While the new synagogue opened its doors in March, Samuels said the construction began after he arrived in Bellingham in 2012. “The reason it took so long to build was to avoid incurring any debt,” he said. “Just as the early Bellingham Jews bought the Broadway building outright, we wanted to do the same with the new space. 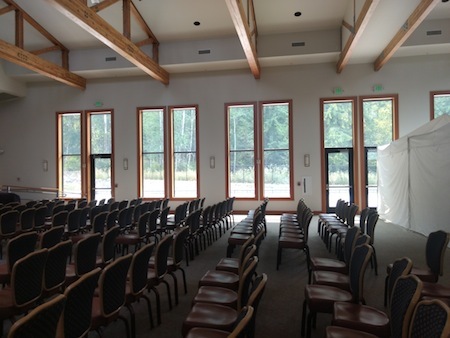 The sanctuary can seat more than 500 congregants, and there is an outdoor patio overlooking the woods that can accommodate almost as many. The building has 10 classrooms, two kitchens, a preschool, library, study space and tons of storage. And the congregation continues “to look for opportunities to host events, speaker series, movies, classes, etc.,” he added. As well, they would like to participate in more cross-border collaborations, he said. Samuels believes that his Lithuanian ancestors would be happy to see their tiny Torah in its new Bellingham home, at the shul in the woods. He said the Torah reminds him of his grandfather Jack (Yaacov), a real mensch who died when Samuels was 7. His grandfather – whose mother had brought the Torah to the United States – helped build a synagogue in Fargo.